LINCOLN, Neb. 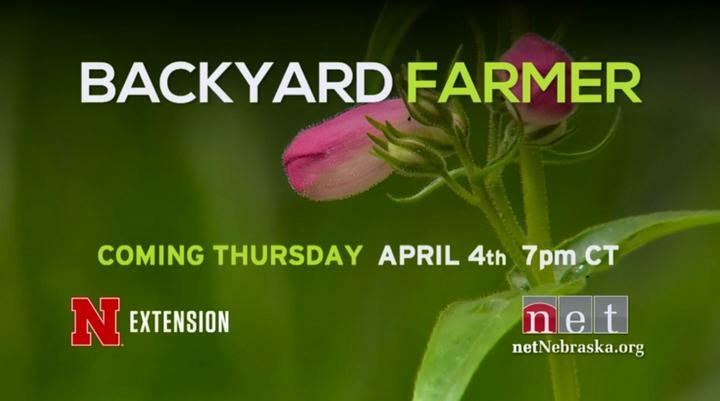 (March 21, 2019) – The popular lawn and garden series “Backyard Farmer” is back with a smart new season beginning at 7 p.m. CT, Thursday, April 4, on NET, Nebraska’s PBS & NPR Stations. Every year from spring to fall, host Kim Todd, Nebraska Extension landscape horticulture specialist, and a panel of Nebraska Extension experts helps viewers answer questions about insect pests and disease, turf, and fruits and vegetables, as well as landscape design and general horticulture topics. The first program of the season will include introductory gardening tips, as well as a feature about care and timing for apple trees. The focus of the April 11 show will be helping gardens and green space recover from a difficult winter and spring flooding, a general look ahead at the forecast and the first part of a series about how to grow tomatoes. The format of the 67-year-old “Backyard Farmer” series continues to include the popular viewer “question and answer” segment. To submit a question or photo for the experts, viewers can email byf@unl.edu. Television remotes planned for the season include: Bayside Golf Course near Lake McConaughy in Brule (taped Monday, June 3 at 6 p.m. CT to air June 6) and the Nebraska State Fair in Grand Island (taped Monday, Aug. 26 at 4 p.m. CT to air Aug. 29). Viewers from the area are invited to be part of the television audience during the live taping at these locations. The “Backyard Farmer” website (byf.unl.edu) features more about the series and the Facebook page feature announcements and other garden information. In addition, past features and episodes are available for viewing on the program’s YouTube channel and as a free podcast on iTunes. The longest-running, locally-produced television series in the nation, “Backyard Farmer” airs Thursdays on NET through Sept. 12. “Backyard Farmer” repeats Saturdays at 10 a.m. CT on NET and Sundays at 3 p.m. CT and Mondays at 5 p.m. CT on NET Create.